Inside the Null Corporation laboratory, Raphael and Alopex have their hands full dealing with Zodi and Krisa (the snake mutant). As Alopex wails on Krisa, she notices that she seems frightened of actually fighting. Alopex gives her the same speech she'd previously given Zodi about freedom and not being anyone's pawn and Krisa is receptive to it. Meanwhile, Zodi gets the upper hand on Raph and is about to put her stinger through his brain. 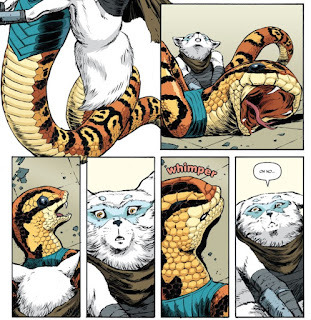 Krisa coils around Zodi, incapacitating her ant tells Raph and Alopex where to find the stolen pet shop animals. The pair promise to come back for Krisa, and leave the room. As Raph and Alopex beat up more Null Homunculi and secure the cages of pets, Zodi talks Krisa into reconsidering her defection. She tells her that they can consider themselves "agents" instead of "product" if they want, but that this is what they were mutated for and is their purpose in life. And furthermore, considering what Null has planned for the Earth, being mutated is the only way ordinary animals will ever be able to survive. Raph and Alopex stop by the room and tell Krisa to come with them. She says she has to stay and keep Zodi at bay, so they must leave without her. Reluctantly, they abandon Krisa and escape in a stolen van with the pets. Alopex is distressed at having to leave Krisa behind, but Raph assures her that she's a tough fighter and they'll save her someday. They then ponder how they'll be ditching the van full of pets for the cops to find. Back at the building, Madame Null herself is dressing down Zodi and Krisa. Zodi takes full blame, covering for Krisa, insisting that she misread the situation and put a "product" that wasn't ready into battle. Null lets Zodi slide in consideration of her past record, then warns Krisa that she will not get another chance to make a mistake and dismisses both mutants. She then contacts a mysterious individual and assures them that they remain on schedule to purge the planet for their arrival. Outside the office, Krisa asks Zodi why she covered for her and Zodi says that she sees a lot of potential in Krisa to be a "killer product". After a long night of beating up thugs with Casey, Raph returns to the lair to try and get some sleep. Instead, he's kept up all night by Michelangelo and his loud video games. 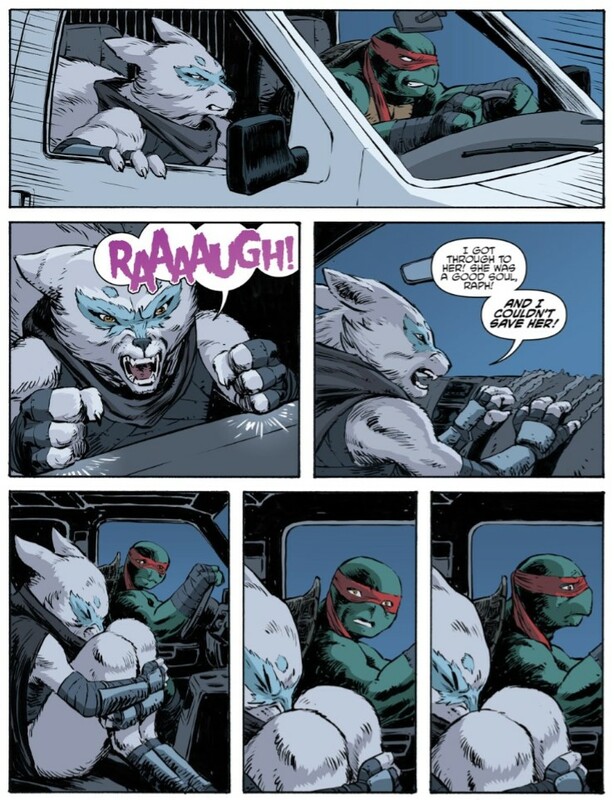 Angered, Raph confronts Mikey and they get into a fight. 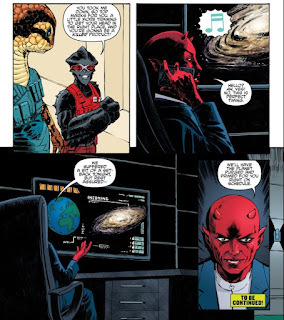 Raph asks Mikey what he's really upset about and Mikey admits that with everything going in involving the Pantheon, Bishop and Leatherhead, he just hasn't been able to sleep. Tired after their fight, though, Mikey decides he's ready for some shut eye. Satisfied, Raph goes back to bed. Unfortunately, as soon as he shuts his eyes, he's woken up by the sound of Donatello loudly soldering electronics in his lab. 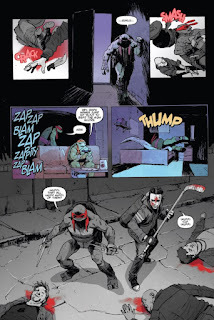 *This story is continued from TMNT Universe #19. 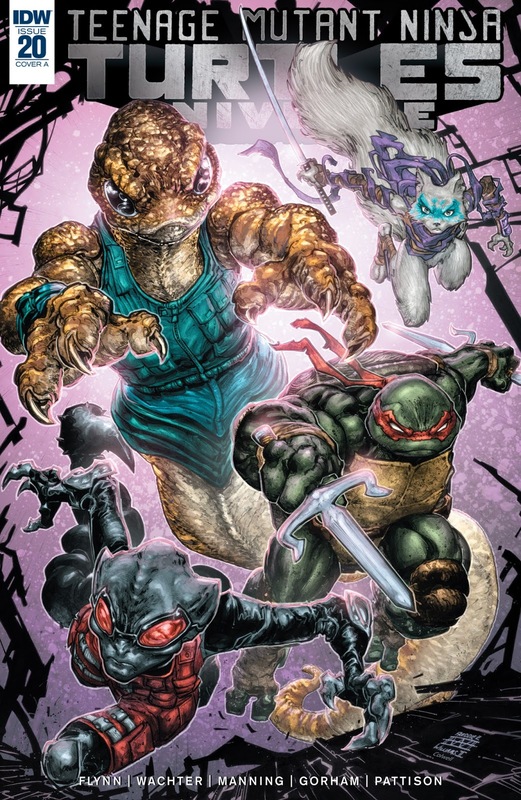 A new story begins in TMNT Universe #21. *This issue was originally published with 3 variant covers: Cover A by Freddie E. Williams II and Jeremy Colwell, Cover B by Dave Wachter, and Incentive Cover by Tim Laddie. I think this is probably the best storyline Alopex has been in since... since... Alopex finally has a good storyline! As a character, she's been all over the map since her introduction and the writers haven't been able to settle on what they want her to be and where they want her to go. So she's had a shaky allegiance that ran for almost sixty issues and was a plot element that overstayed its welcome by at least thirty of that number. She's been in a trio with Harold and Nobody, but bad writing has often wound up giving her stilted dialogue where she has to explain the depth of her friendships for the audience's benefit rather than let the storyline show those friendships naturally. Then there's her whole romance with Raph that's been incredibly hard to swallow considering they're rarely afforded the opportunity to say more than two words to each other a year. Then there was that violent personality shift she received in the wake of TMNT #66, where we learned that the characterization she'd been displaying since her debut was not her "real" character, just what her brainwashing had turned her into, and that Alopex's "real" personality is actually that of a giggling ditz who behaves nothing like how she'd been portrayed up until that point. All of that was seemingly done to absolve her of accountability for being shown enjoying killing people in her earliest appearances. Alopex has had the capacity to be a good character, all the elements are there, the writing just hasn't been coordinated enough to pull it all together. She's a different person every time a new writer picks her up and you can't get invested in a character that has no stable personality elements. I hope that moving forward, Flynn's depiction of Alopex, and especially her relationship with Raphael, is viewed as the standard. She's got a fun dynamic with Raph and they come off more like close friends who get each other than lovers. And that's good, because if we're going to get this romance angle, then it needs to be built up from scratch (as it never had a solid foundation to begin with). Bad writing is when the characters have to awkwardly state their relationship to one another so the reader knows that such a relationship exists. Good writing, such as this, shows us that relationship in the way they interact and the chemistry they develop. I can tell you more about Alopex as a character and her dynamic with Raph just from these two issues than I could after reading her two dozen previous appearances. We're spoonfed a bit more of the Madame Null storyline. And I do mean spoonfed. The little itty bitty morsel of progress we now have is that Null plans to help some outer space entity take over the Earth. Not a whole heck of a lot to go on, but considering that for the past two years, Null's angle could be summed up as "she makes mutants and she's evil", I guess this is something. So the question remains: WHICH extraterrestrial faction is Null scheming with? "Service Animals" takes place before the "Invasion of the Triceratons" storyline, but I don't think she's cooperating with the alien dinosaurs. The likeliest suspect would be Maligna, who made her IDW debut during the "Trial of Krang" arc. Null worked with Maligna during the Archie TMNT Adventures comic, so re-teaming them for the IDW continuity would seem like the most intuitive option. There are other alien factions out to take over the Earth, but again, this story takes place a while back in the timeline, actually before "Trial of Krang", even. So the Triceratons wouldn't be after the Earth yet and the rogue Utroms on Burnow Island wouldn't be out to revive Ch'rell yet, either. It kinda has to be Maligna (or somebody new) in order to keep continuity straight. But then again, she wasn't introduced until "Trial of Krang", so how does she know about Earth? Aww, whatever. We'll find out in six years or however long it takes this arc to develop. Krisa, the new character, could have potential; a conflicted being caught between her conscience and her misguided loyalty to what might be a genuine friendship with Zodi. Hopefully she gets developed further at some point in time, but this comic barely has the time to develop the characters who have been around for four years. Take a number, scaly. The back-up by Manning was fine, but I'm suspicious that it was a script he wrote for IDW's Nickelodeon TMNT comics that just got slightly revamped and recycled for the main IDW continuity. It reads the same way as his back-ups in those comics, right down to the droll punchline at the end. I think the biggest tip off that this was a reworking of a New Animated Adventures or Amazing Adventures script is what Donnie is working on in his lab. It's a Mini Metalhead, just like the one that appeared in the TMNT Amazing Adventures #9 back-up. Still, hey, there was a decent amount of blood in this back-up; betcha that wasn't in the script when it started as a Nick TMNT comic. 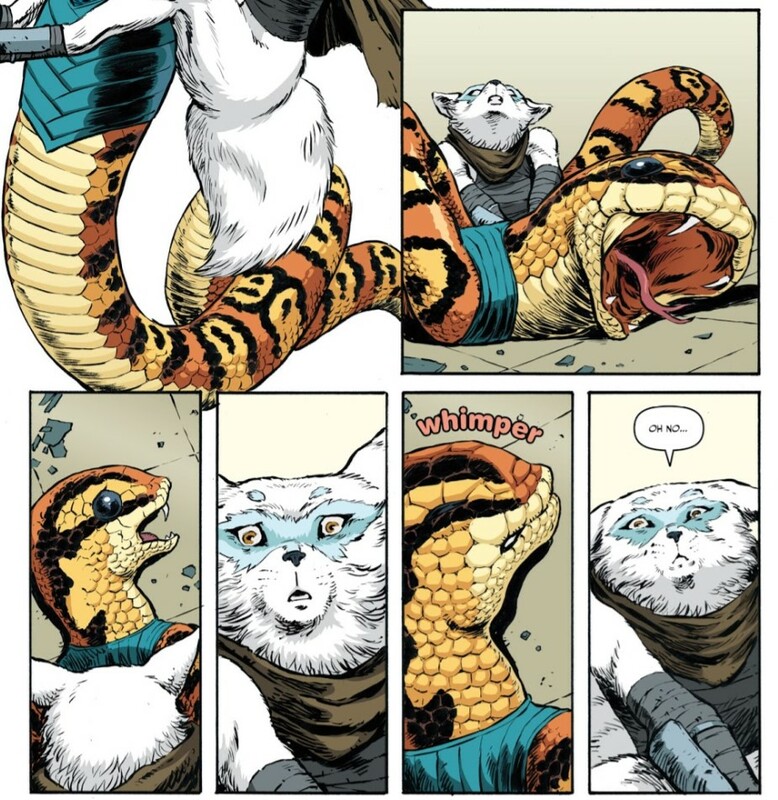 When all is said and done, "Service Animals" is a good comic for how it treats the characters, not so much for anything involving the plot or the development of ongoing storylines. If anything, it comes off as a proof-of-concept pitch, trying to sell readers on the idea that Alopex CAN be a good character and her relationship with Raph CAN be fun... it all just has to be written well. Ha, watch it be Lord Dregg. You sell giggling Alopex too short—she can be fun that way. Compare how Sophie writes Alopex in IDW with the way she writes her in her Secrets of the Ooze webcomic. Not just the humor angle, but the volatile moods angle full of catty back-talking sass, in a way that starts to remind me of Raphael early in the 2012 TV series. That said, "Service Animals" is indeed a good Alopex story. I just don't see how the Alopex we see here need necessarily be incompatible with the Alopex we see when Sophie's writing her. Sometimes a character can be tough and formidable and deep and vulnerable and still know how to gossip and chat it up. At least to me, it doesn't make her a weaker or more annoying character - it makes her a more relatable character. You're right that "Through Red Eyes" reads very much like a NAA/AA backup strip...which isn't necessarily bad. Sometimes I like those little slice-of-life moments when not much else is happening in their lives, and this one was on-target in that regard. And this type of TMNT backup comic didn't just start with NAA/AA—there've been a lot of Mirage-era short comics with a similar downtime feel, like "Not One Word!". These comics add bits of color to the characters' lives, and that is good—I wouldn't mind seeing even more like that. Replying to what the other anon comment said, I have been wondering how they're gonna introduce dregg, but does anybody really care about him at all?